In this example we are going to create a Symfony API and secure it with OAuth1. User will have a "Consumer Key" and "Consumer Secret" in order to consume our API. Add SetEnvIf Authorization .+ HTTP_AUTHORIZATION=$0 to you vhost file otherwise Apache will strip "Authorization" header. 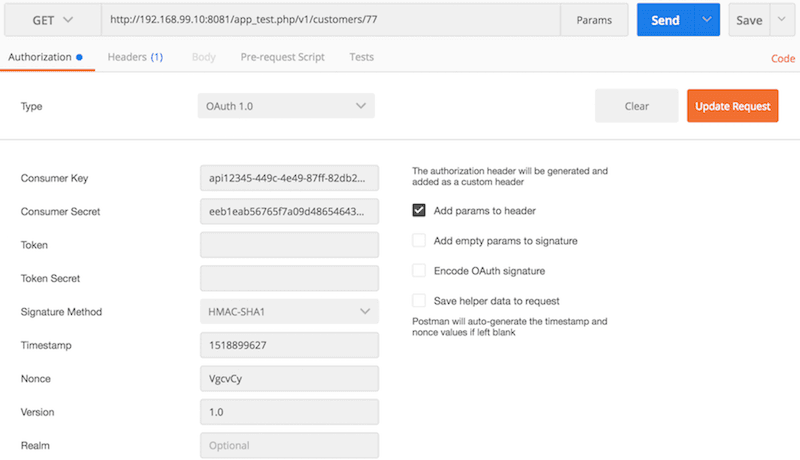 You must install PHP OAuth extension with sudo apt-get install php-oauth otherwise you won't be able to use generateSignature() method of OAuth class. Restart Apache service after the changes above. In the case of authentication failure HTTP/1.1 401 Unauthorized error is returned and example errors below are logged. All you have to do is, provide Consumer Key and Consumer Secret data in "Authorization" section for "OAuth 1" option. Postman does the rest for you. See images below. You can obtain cUrl codes from the "Code" button on the right hand side.